“Yes, we’re cooking an apple pie right on stage,” said Maria Gobetti, co-artistic director of the Victory Theatre Center. 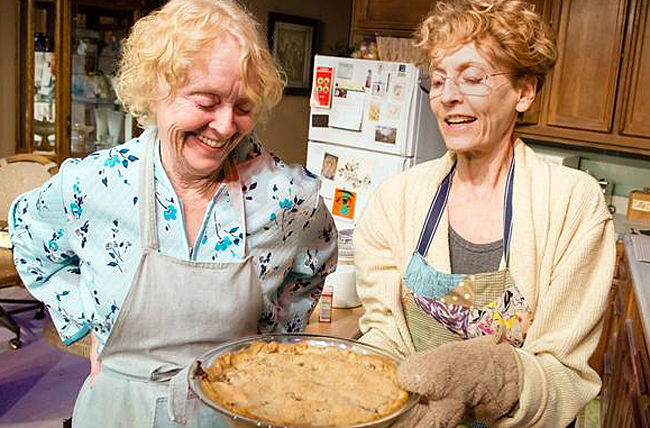 Make that two dozen apple pies — one pie will be baked from start to finish during each of the 24 performances of Lawrence Thelen’s new comedy, “Pie in the Sky,” premiering in the intimate Little Victory Theatre on Friday. Thelen’s two-character comedy takes place on an unexpected day in the lives of an elderly mother and her daughter, both widows, living together in an Abilene, Texas, mobile home. As Mama and Dory (played by stage and screen veterans K Callan and Laurie O’Brien, respectively) work together to make an apple pie, their conversation shifts during all the peeling, measuring, crust-filling and baking between the task at hand and deeper issues, sparking certain revelations. When the pie (baked in a working oven on stage) is done, the play is over. With that in mind, Thelen, a home cook and father of two, was baking an apple pie when it occurred to him that the process — assembling the ingredients, mixing them together, preparing the crust and baking the pie — could be an interesting structure for a play. And then he remembered an incident in the 1990s involving his mother and grandmother. “Something happened, and my grandmother said [an expletive],” Thelen said. That family story inspired the first scene Thelen wrote as he began envisioning a conversation between an 85-year-old mother and her 65-year-old daughter. Gobetti, who is directing the production, said that one thing that attracted her interest — having had a difficult relationship with her own mother — is the play’s positive message about mothers and daughters. “It was nice to read a play that is equally dramatic and comedic, where there was a mother figure who is tough but loving,” she said.